This book was inspired by God with the desire to help children who have been hurt by words. Shown in it is how Jesus steps into the picture to help them realize just who they are in Him. He sings a song and loves sobs away as He gives the proper way to respond to this situation while encouraging prayer. Jesus is a young boy and He has great friends like Lazarus, Mary and Martha who are the only ones who know Him as the Prince of Peace "The Gang" is there to help their friends through this as well by leading them to Jesus. Anne Carter is a wife, mother and grandmother. She has worked in Children's Ministry for many years including Bus Ministry, VBS, Children's Minister, and director of VBS. Her heart's desire is to see dysfunctional families learn to be the opposite through the teaching outlined in The Word. With this is also the desire to bring us closer to Him so we can succeed in ministering to small children who cannot do it alone. 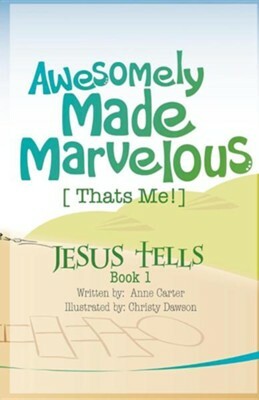 I'm the author/artist and I want to review Awesomely Made Marvelous.